Press the tofu by putting on a plate or in a dish, then put another plate or dish on top of it, and place something heavy on the top plate, such as canned beans. Let the tofu sit for at least 15 minutes. It’s best if you pour off the water two or more times. To stir-fry tofu, heat a non-stick wok as hot as you can, then add some oil with a high burning point such as canola oil or peanut oil (not olive oil). Add the tofu to the pan and cook until golden brown on all sides. 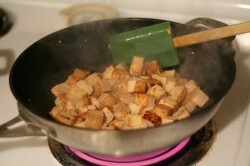 The tofu will cook better if the wok is only about half full – don’t crowd the pan. Many people I have talked to say they do not like tofu, and frequently they say it is because of the texture. What this really means, is that they have not had tofu that has been prepared well. There are several things to keep in mind when cooking with tofu. First, make sure you buy the right kind of tofu. There are two kinds — firm (regular) and silken. Here is where it gets a bit confusing, as each kind often have different firmness labels as well. Usually silken tofu is sold unrefrigerated in a tetrapak, while regular tofu is sold in a plastic container and is packed with water. For most recipes you will probably use regular tofu. For anything that gets blended, you want silken tofu. The most important thing about preparing firm (regular) tofu is to press it. Pressing the tofu gets rid of excess water from the packing. Getting rid of the water allows the tofu to absorb more of a marinade (if you are using one), and it will also allow the tofu to be fried better. For most stir-fry applications, I usually shallow fry the tofu a bit. If the tofu has lots of water in it, it will end up being boiled instead of fried, and will not achieve the desired texture. Pressing tofu is quite easy. 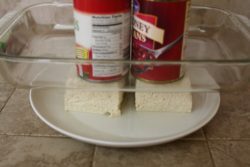 Simply place the tofu whole on a plate, then put another plate on top of it (upside down), and place something heavy on the top plate, such as canned beans. Let the tofu sit for at least 15 minutes. It’s best if you pour off the water two or more times. Unlike raw meat, having put raw tofu on a plate does not harm it all, so I frequently use the same plate to eat off, saving me the trouble of washing some extra dishes.